Bring your work to life in vivid colour detail, sharp QHD resolution and extensive connectivity for outstanding usability. Award-winning performance: Since each monitor is tuned at 99% sRGB, the colours look amazing right out of the box. The ultra-wide viewing angle on this 63.44 cm (25") display lets you admire the QHD resolution at virtually any angle without losing those gorgeous colours. Reliable and eco-efficient: Count on the DellTM Premium Panel Guarantee, 3 years Advanced Exchange Service and an environmentally conscious design. Superior screen clarity meets complete colour precision for a brilliant viewing experience. For convenient connections to other devices in your workspace, the U2515H provides two HDMI (MHL) ports, a DisplayPort, a mini-DisplayPort and five USB 3.0 ports. Quickly charge BC1.2 compatible and other USB devices with a USB 3.0 port found on the rear of the monitor that supplies high-speed charging and powering. Your Dell UltraSharp 25 Monitor – U2515His designed to be pixel perfect. That’s why if you find even just one bright pixel, we’ll replace it under our Premium Panel Guarantee. 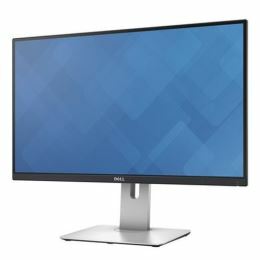 The Dell UltraSharp 25 Monitor – U2515H meets the latest regulatory and environmental standards.